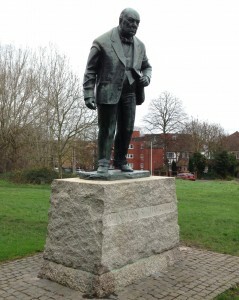 This week I passed a statue of a great man on Woodford Green. Who among us could hear those words and fail to look around for a fascist dictatorship to defeat? Not I. That’s why I immediately set about decking anyone shifty I could see nearby. Who have you decked recently, and why? I decked some acorns and stole their hats because I was pretending to be my hero, Joog. Good for you. Acorns have been keeping those woody berets to themselves for too long. It was the way they looked at me that spurred me to act. You know that look when they look at you but it’s more of a glare than a look? It was that. Pretty messy. I hurt my paws too. What that response had was a big fat nen. What it should have had was first class comedy. It was a bit of a blow, if I’m honest, but I’ll get through it with a little help from my friends and substantial financial compensation. Compensation from who? The ‘Should’ve Been Funnier’ department? They have fierce opening hours. Those jokers don’t even answer the phone. It’s not even funny. No Christopher, they barred you because you call them too often, don’t you remember? That’s not funny. I’m calling the “Should Have Been Funnier” department again. They’ll just tell you that you should’ve been funnier. Try the National Whinge Line instead. I find that the National Whinge Line, or NWL as they’re known in close circles, do more whinging than listening when I call. I was on hold for half an hour once and when someone picked up they shouted, “Woe betide you!” and hung up. That’s more a gloomy portent than a whinge, I’d say. … but there’s no gloomy portent line.